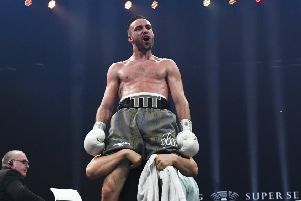 Josh Taylor took the biggest step of his career in setting up a world-title shot after beating Viktor Postol on points in Saturday night’s WBC Super-Lightweight final eliminator, but he was made to earn it across 12 rounds. Former world champion Postol represented by far and away the most difficult challenge of Taylor’s professional career. Before Saturday, the only man to have defeated the Ukrainian was current WBO Welterweight world champion Terence Crawford – a testament to just what Taylor has achieved. This was the first time Taylor has gone beyond ten rounds, although you wouldn’t have thought so given the way he ended the fight, which was required after Postol had enjoyed some early success. “He came here and I think he fought the best fight of his career,” said Taylor afterwards. “He came here and it was his last crack of the whip. If he’d beaten me he would’ve been back in title contention. He came in the best shape of his life and it showed. “His feet were livelier than I’d seen previously. He surprised me and three or four times during the fight I had to adapt the way I was boxing. I was getting caught early on and my defence was a bit too leaky but I got the job done eventually. “It was a huge step but I didn’t feel like it was anything I couldn’t handle. Not once did I feel uncomfortable or feel like I was out of my depth. I was just trying too hard and when I did relax I got my shots off and started coming on strong. A tight encounter didn’t start as Taylor would have wanted, with Postol able to get through the Scot’s defences a little too regularly for the liking of most inside the arena. A strong left to Postol’s chin at the beginning of the second put the home crowd on its feet, as did a similar shot in the fourth. Postol was on the canvass in the fifth, although it was down to a loss of balance rather than anything Taylor caught him with. Postol was proving just as tough as was expected, using the jab to good effect and looking for a right hook to Taylor’s body. The big shots at the start of the seventh were coming from Taylor who had increased the pace, but his opponent responded brilliantly with a combination that had Taylor back on his heels as the Ukrainian finished strongly. Taylor’s moment came in the tenth when he sent Postol sprawling with a big right hand. He made the count, but Taylor looked to keep the pressure just as the round drew to a close. Postol responded in the 11th round with some fast hands only for Taylor to wobble him at the start of the 12th with a thudding left. The sense was that Taylor had done enough as the fight wore on, although even taking into account the knockdown, the scorecards of 116-110, 117-110 and 119-108 respectively, suggested a gap between the two that just wasn’t there, which Taylor and trainer Shane McGuigan readily admitted. Next up is Taylor’s dream – a world-title fight, in all likelihood against WBC Super-Lightweight champion Jose Ramirez, with New York a potential venue. “He made his debut on the card of a world-title fight in El Paso,” said manager Barry McGuigan. “He’s fought in big stadiums and arenas around the world as an amateur. There’s much more pressure on him now as a pro, the occasions are much bigger and it’s all on you; you don’t have seven or eight team-mates that are shouldering it as well.